On October 22nd, twenty-five of the world’s top contemporary artists were brought together for the first event of the Elephants Forever project- the biggest elephant fundraiser in the world this year. The project’s aim is to empower the work of Elephant Family and Space for Giants, two non-profit charities who raise funds that are critical in preserving natural habitats of the wild elephant, as well as funding innovation anti-poaching initiatives. 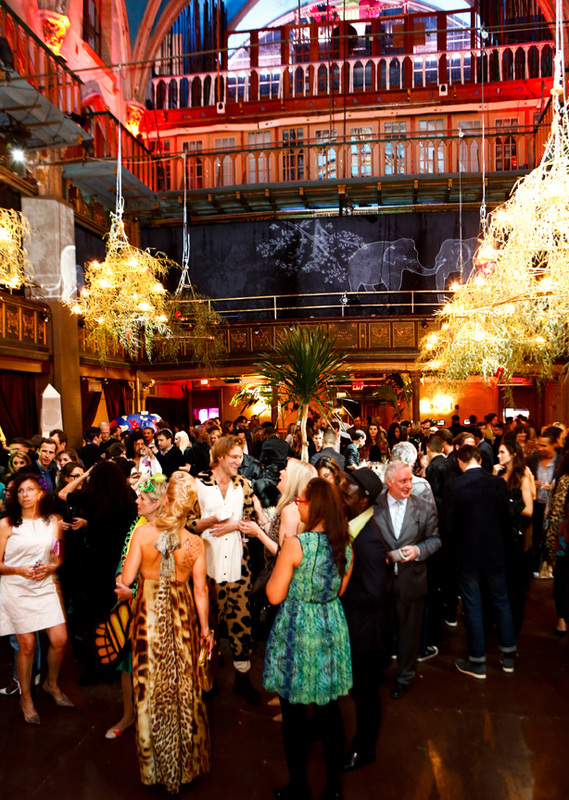 Held at the Angel Orensanz Foundation in New York, the jungle-themed event was an exhibition to showcase the works of art and bring awareness to the cause. Curated by Roya Sachs, it included artworks by Tracey Emin, Rob Pruitt, Walton Ford, Urs Fischer, David Yarrow, Tom Sachs, and many more. Attendees included Susan Sarandon, Fern Mallis, Waris Ahluwalia, Zani Gugelman, Genevieve Jones, Jessica Joffe, Keren Craig, Amirah Kassem, Chloe Norgaard, Michael Avedon, Douglas Friedman, Minnie Mortimer, Alexi and Giada Lubomirski, Yvonne Force Villareal, Mazdack & Zanna Rassi, Sarah Hoover Sachs, Scott Lipps, Andreja Pejic, Kenza Fourati, Vita Sidorkina, Alexander Gilkes , Alessandra Balazs, Sophie Elgort, Bonnie Wright, Meredith Ostrom, Michael Sam, Walton Ford, Petroc Sesti, Y.Z. Kami. The art was displayed in a beautiful jungle installation encompassing two floors while Google Cardboard brought the Samburu region in Africa to life with their virtual reality Google Map’s Expeditions. Downstairs a video projection of a family of elephants surrounded the guests as they enjoyed a musical performance by Bernardino Femminielli with special guest DJ’s Brett Stabler and Justin Miller. The second part of Elephants Forever will be a live auction of the exhibited artworks. Hosted by Owen Wilson in partnership with Maclaren, it will be held at Sotheby’s on October 27th. Online bidding is available here.